Last week's Fashion Over Fifty Post I showed you a warm weather skirt that I 'winterized' to wear during the colder months of the year so that I could get more use out of it. These week I have a similar outfit, only this time I have a summer dress on instead of a skirt, and I'm keeping warm with a jacket instead of a cardigan. Like the skirt in my previous post, this dress is suitable to wear in the winter because the colors are dark. Both the dress and the cropped jacket are from Express and are several years old. The dress is a chiffon type material. I belted it to accentuate my waist. I'm wearing the same black tights and booties from Famous Footwear (old). My Western style purse I picked up in a gift shop while vacationing in Colorado last fall. For jewelry I wore a black and gold necklace, and gold bracelets. On a side note, this dress was one of the very first items I ever bought from Express, and it began a long allegiance to their store. I actually bought it for my daughter, but she loaned it to me for this photo shoot. And for those of you who haven't heard or noticed the new ad in my sidebar, I started selling off my clothes. Most of the items have only been worn once or twice, and some not at all. I'm adding new items to my closet daily. If there is more than one item your interested in, ask me to 'bundle' those items before you click to buy, then you only have to pay shipping once. 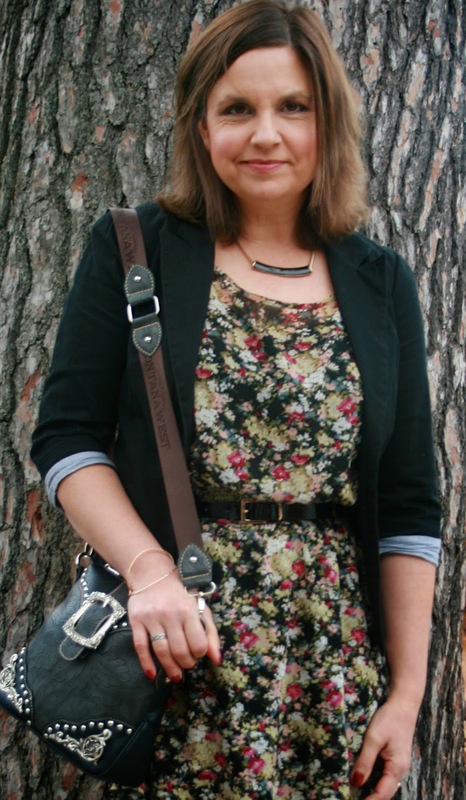 Linking up with: Casual Friday, Passion for Fashion, Favorite Fashion Friday, Fashion Friday, Sydney Fashion Hunter, Manic Monday on the Daily Express and More Pieces of Me, and Fashion Should Be Fun. 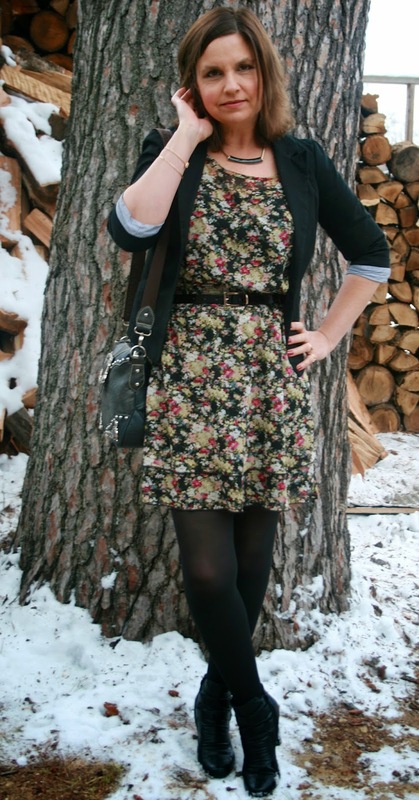 Love the pretty floral dress on you, and the styling with black tights and boots. Looks great. I am all about florals. Hope to see you at my Link up Turning Heads on Tues March 17! Hi Amy, Great outfit again!